Blocked gutters can cause sagging or detachment of joints. It will also stop the flow of water. This water will build up and it will overflow. Not only is this really annoying but it can find it’s way into the building itself causing very expensive repairs. Blockages can build up anywhere in gutters usually in the most awkward of places to reach for example over conservatories or at a height which is dangerous for ladder work. 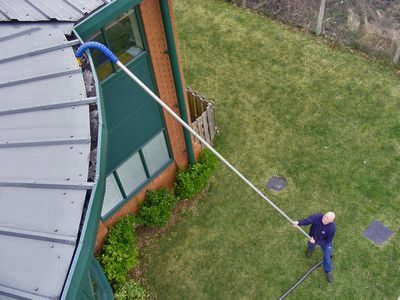 This is not a problem for a gutter vacuum with the super-lightweight, carbon fibre poles access is gained with ease and provides a cost effective solution to gutter clearance. We can offer many solutions and more.